We have long lamented over the sad fate of Our Pristine Tarot and Enlightened Commentary. In recent centuries, you, my beloved children, have been led astray from them and Our pure wisdom contained therein. In recent decades, you have been led even further astray by the self-styled hierophant, A. E. Waite, his psychic artist, Pixie Smith, and the product of their alliance, a corrected Tarot, which has become the most popular and least correct Tarot ever. Waite, a purveyor of malted milk and the illegitimate son of a sailor (I am not making this up!) sought to enter the Temple of the Divine Fifi-Ho-Tep-Trismegista, position himself as Hierophant of the Occult Arts, and correct Our millennia-old Tarot. He failed on all counts. Rather than pierce the protective Veil of Our Sanctum Sanctorum, he died a beggar in the pronaos, where he told all who would listen (not many) that he alone possessed the Secret Doctrine and true Tarot because he alone possessed the necessary mystical faculties with which to enter into intimate relationship with the Shekinah. In reality, he was popularly referred to as the King of Cups in Tatters. 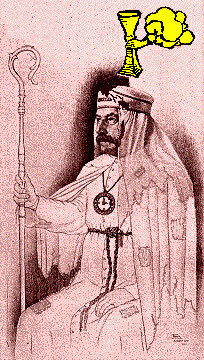 Illustration (above): A. E. Waite as the King of Cups in Tatters. Click the image for a larger one. Worse, today a multitude of errors awaits the users of his book, The Pictorial Key to the Tarot and its popular companion deck. We will highlight only a few of the most egregious in the following short syllabus of errors. The following positions are condemned as errors which lead unwary Tarotists to fall into the Black Ever Rolling Abyss, wherein they ever delight in unintelligable images. Condemned: The Fool is assigned to zero, Strength, to eight; and Justice, to eleven. These errors are principally the product of a self-styled adept, who sought to conform Tarot to his delusions, by jettisoning truths which had withstood millennia and preaching, among other falsehoods, an erroneous re-numbering of the Keys, which has rendered them unusable except on the lowest plane. We speak of an anonymous forger and the product of his misguided fantasies, the Golden Dawn Cipher MS. However, we roughly and more appropriately, refer to it as Golden Dawn Cipher BS. It is upon this BS which Waite foolishly built his house of cards, including the re-numbering of the Keys. Need we say more? Condemned: The numeric cards of the Minor Arcana may be illustrated with genre scenes in lieu of pips with salutary effect. For millennia illustrated numeric cards were virtually unknown and for good reason. However, Waite, with his Pixie as his right hand, threw tradition overboard and produced a pop Tarot, the principal attraction of which is the strange figures depicted on said numeric cards. With their introduction, he actively encouraged anyone and everyone to stare at them and use their intuition to tell fortunes and discover profound truths. Virtually every gypsy, charlatan, and child of the New Age uses this pedestrian pack or one of one of numerous clones thereof. Additionally, virtually all dumbed-down books about Tarot are illustrated with this deck or one of numerous clones thereof. Thus Waite inaugurated the current lamentable Age of Tarot Pop-ism. Condemned: The Bearer of the Baton (Bateleur) may be denominated The Magician; The Papess, The High Priestess; and The Pope, The Hierophant. Although these grievous errors had been occasionally preached previously by other equally foolish Tarotists, Waite popularized these corrected titles, which, again, rendered the Keys unusable except on the lowest plane. Condemned: Waites Pictorial Key to the Tarot truly explicates Tarot and ought to be studied and meditated upon by all Tarotists. Waite paraded this grand colportage and pompous tome of confused ideas and rambling ambiguities as fragments of a Hidden Tradition. They are really fragments from works of other Tarotists and, when not so, fragments of his ill-formed imagination. Tarotists may read it if they must; however, they should take everything expressed therein with a grain, nay a pound, of salt. My beloved children, because of the corruption of Our Tarot, we yearn to re-publish Our Pristine Tarot and Enlightened Commentary. However, because you have fallen so far away from Our pure wisdom, you would fail to understand even one one-hundredth of it. For Us, therefore, to re-publish Our works today would do you absolutely now good. Yet, We are deeply concerned for your spiritual welfare. Therefore, to begin to awaken you from your Tarotistic somnolence, We give you here The Pictorial Key to the The Tarot of the King of Cups in Tatters (Being Fragments of a Secret Tradition Under the Veil of Parody), which explicates the companion deck, The Tarot of the King of Cups in Tatters, a thoroughly revised and corrected edition of Waites popular cards. Although these works cannot replace Our Pristine Tarot and Enlightened Commentary, We are confident that they will assist many of you, my beloved children, to begin to see the true Tarot albeit in a mirror darkly. We urge you to study and meditate upon these works now. Know, however, that such study requires patience and careful consideration of every word contained herein. You are not about to read Gray, Greer, Bunning, or Pollack. Know that such study requires patience and careful consideration of every image contained herein. You are not about to study the Hanson-Roberts, Halloween, Dragon, or Unicorn decks. Further, know that the time is not far off when We will indeed re-publish Our Pristine Tarot and Enlightened Commentary, but only those who have studied and mastered that which follows here will be prepared to receive Our Wisdom in its purity and totality. My beloved children, like puppies on the third day, open your eyes! See Tarot as it was, is, and ever shall be. 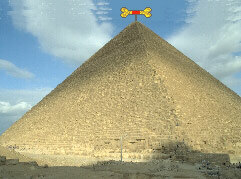 Illustration (above): The Pyramid of the Divine Fifi-Ho-Tep-Trismegista in the Valley of the Dogs, Egypt. Some say that Her original Pristine Tarot and Enlightened Commentary are stored in a secret chamber below this structure. Published this seventh day of the third month of the 6,327th year since Our giving of the Pristine Tarot and Enlightened Commentary to humankind. Hagios, Hagios, Osorronophris. Amen. Above: The Great Seal of the Order of the Gold and Rosy Bone of the Divine Fifi-Ho-Tep-Trismegista. Copyright &COPY; 2000 James W. Revak. All rights reserved. Version 1.0 (4/12/00).